Donald Trump has been great for white supremacists. 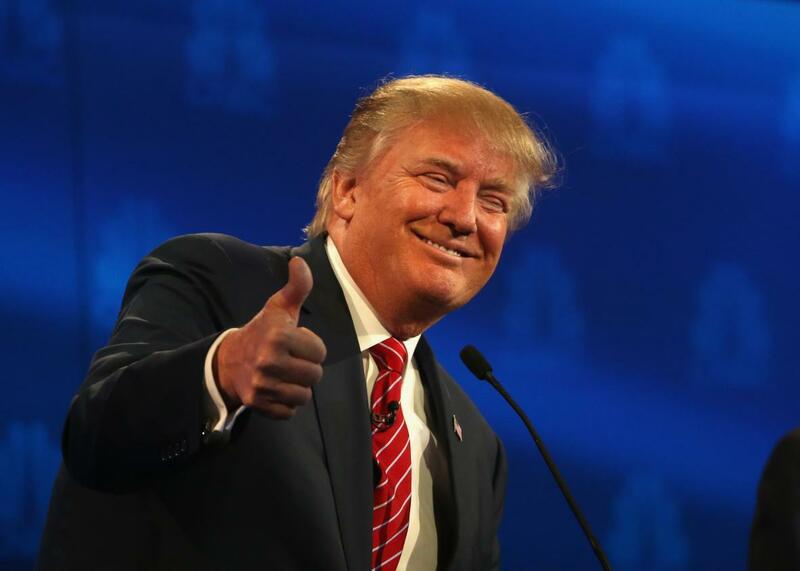 Presidential candidate Donald Trump gives a thumbs up during the CNBC Republican Presidential Debate in October. Citing racist groups, web sites, and leaders, along with organizations that track hate groups, Politico makes a compelling case that Trump has been a boon for the white supremacist movement. The prime example comes from Stormfront, the most prominent white supremacist web site in the United States. The site’s founder, Don Black, told Politico that Stormfront has experienced a Trump traffic surge and that his radio call-in show is getting a boost in listeners and call volume. He said that his site was receiving a 30-40 percent traffic spike thanks to news about Trump’s anti-Muslim and anti-immigrant remarks, and that he needed to upgrade his servers because of Trump traffic. And former Louisiana legislator and Grand Wizard of the Ku Klux Klan David Duke told Politico that Trump’s campaign “has made it okay” for whites to talk about racial animus. Politico notes that Trump has disavowed Duke, doesn’t endorse any white supremacist group, and that his campaign ejected a man with a Confederate flag from a recent rally in Virginia. But Trump has targeted Mexican and other immigrants by describing them as “rapists” and “killers” who needed to be rounded up and removed from the country, sent out racist and false crime stats on Twitter, and recently called for the aformentioned Muslim ban. These are just the highlights of the aggressively xenophobic, Islamophobic, and racist campaign he has run so far. So it shouldn’t be surprising that Trump—who topped the GOP field at 35 percent for an all-time high in Thursday’s CBS/NY Times poll—seems to have generated energy for those who are aggressively xenophobic, Islamophobic, and racist. In fact, the New Yorker’s Evan Osnos noted the phenomenon of Trump energizing white supremacists way back in August. On June 28th, twelve days after Trump’s announcement, the Daily Stormer, America’s most popular neo-Nazi news site, endorsed him for President: “Trump is willing to say what most Americans think: it’s time to deport these people.” The Daily Stormer urged white men to “vote for the first time in our lives for the one man who actually represents our interests.” … Matthew Heimbach, who is twenty-four, and a prominent white-nationalist activist in Cincinnati, told me that Trump has energized disaffected young men like him. “He is bringing people back out of their slumber,” he said. The Politico report is just the latest evidence that Trump is waking up something ugly in American life that has been there all along.